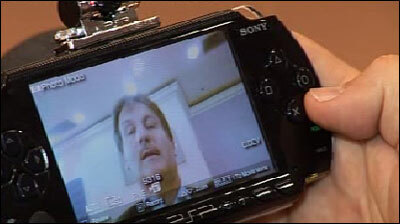 BT's Steve Andrews demonstrates the PSP webcam. Owners of Sony's PlayStation Portable (PSP) handheld console will soon be able to make voice and video calls over a wireless internet connection. Using a soon-to be-released camera and microphone, gamers will be able to call other PSP owners and some BT phones. The software has been developed by BT and will eventually allow PSP users to call PCs, fixed lines and mobiles. Initially the service will only be available in the UK and will only work on home or BT wireless hotspots. Currently, there are around 2,000 of these situated in airports, railway stations, hotels and fast food restaurants. More than 24 million PSPs have been sold around the world, with more than eight million of those sold in Europe. According to BT, the software will eventually be distributed to telecoms companies in 100 other countries. The service is part of a growing trend to enable so called voice over internet protocol (VoIP) on mobile devices. VoIP is a method of routing voice conversations over the internet and was made popular on PCs by services such as Skype. Now, more and more mobile handsets come with wi-fi capability and companies such as Truphone and Jajah offer services that allow people to make VoIP calls, bypassing the traditional mobile tariffs and networks. The new PSP service takes advantage of BT's 21 Century Network (21CN), which is specifically designed to use Internet Protocol (IP) technology. Eventually, 21CN will replace all the existing networks. More details of the BT service will be released at the Leipzig Games Convention in August, whilst Sony's add-on camera and microphone for the PSP, known as the Go camera, will hit shelves in the UK on 25 May. The service is not the first VoIP application developed for handheld consoles. In 2005, Japanese gaming giant Nintendo announced an application called DSpeak for its best selling DS handheld console that allowed users to make VoIP calls. When a user spoke an onscreen game character such as Mario would lip-synch with their voice. The application was never commercialised. However, the firm now sells a headset that allows gamers to chat whilst playing games such as Metroid Prime Hunters. It is not yet available in the UK.